Ah, the pumpkin. Unloved for 11 months out of 12 and then they fly off the shelves faster than you can shout “BOO!”. In 2014 large supermarket chains such as Morrisons pumpkin stock ran completely dry after a poor harvest hit growers across the country. Some people are unaware that pumpkins are in fact a fruit. Many think it is a vegetable and are shocked to find that olives, aubergines and butternut squash also belong to the fruit family. 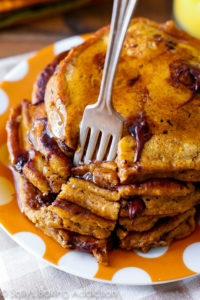 This year the pumpkin harvest has been described as “almost ideal” so why not try out a new pumpkin recipe like chocolate chip pumpkin pancakes! In a large bowl, toss the flour, baking powder, baking soda, salt, cinnamon, pumpkin pie spice, and chocolate chips together until combined. Set aside. I like to mix the wet ingredients in a blender. This guarantees a smoother batter and breaks down the pumpkin. This is especially necessary if you are using fresh pumpkin puree. Add the pumpkin, brown sugar, egg, oil, and whole milk to a blender and blend on high for 45 seconds until combined. Alternatively, you may whisk by hand or use a hand mixer. Blender is best. Pour the wet ingredients into the dry ingredients and whisk by hand gently to combine the ingredients. The batter is extremely thick. Do not thin it out. Whisk until *just* combined, no more. A few lumps may remain. Taste the batter. If you want to add more spices, go ahead. I usually add more cinnamon. Heat a griddle or skillet over medium heat. Coat generously with butter. Once hot, drop about 1/4 cup of batter on the griddle. Cook until the edges look dry and bubbles begin to form on the sides, about 1 minute. Flip and cook on the other side until cooked through, about 2 more minutes. Coat griddle/skillet again with butter for each pancake or batch of pancakes. Keep pancakes warm in a preheated 200F degree oven until all pancakes are cooked. Serve immediately with your favorite pancake toppings. Pancakes taste best right after they are made. Pancakes freeze well, up to 2 months. Instead of pumpkin pie spice, you may use 1/4 teaspoon ground nutmeg, 1/4 teaspoon ground cloves, and 1/2 teaspoon ground allspice.